President Donald Trump’s backing of a bill to limit legal immigration into the United States is designed to improve his falling approval ratings, according to Professor Inderjeet Parmar. The City US politics expert says the move has been made to “divert attention from a whole series of failures of this administration”. 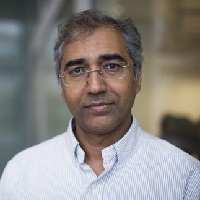 Professor Parmar, of the Department of International Politics, told CNN International he believed the US president’s approval ratings would continue to suffer after hitting “an historic low”. Professor Parmar explained Trump’s stance on immigration is proving to be the most popular aspect of his presidency with the US public, and is therefore focusing on it amid negative headlines. The City academic said the focus on immigration policy might stabilise Trump’s ratings in the short term, but was in “dangerous territory” because of the proportion of people telling polls that they “strongly disapprove” of the President. “It suggests that there is kind of a long-term slide which is going on, and I suspect that is going to deepen,” he said. Professor Parmar is head of the Department of International Politics at City.